Need to get rid of Bald Faced Hornets? WHAT ARE BALD FACED HORNETS? 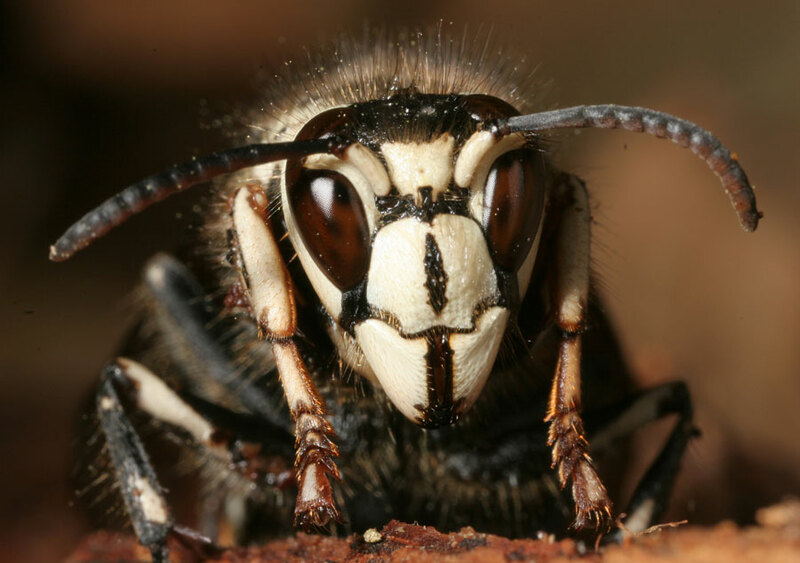 The bald-faced hornet got its name due to the ivory-white markings on its face. Hives can contain hundreds of workers, which usually become visible in the late summer when numbers are at their highest. Bald-faced hornets can grow to ¾ inch long and are easy to identify because of their distinct black and white bodies and smoky wings. WHERE DO BALD FACED HORNETS LIKE TO LIVE? Bald-faced hornets build a hanging paper nest at least three feet from the ground and can be as much as 14 inches in diameter and surpass 24 inches in length. Their nests are made by chewing up strips of wood and mixing it with their saliva. This wood can consist of bits of fences, wooden decks, siding and so on – thus their hives can have beautiful striped coloration. The occasional forager is not a concern, but if you see their hive or notice consistent activity all day long at one location, you should consider having the hive removed. Worker bald-faced hornets are aggressive about defending their homes and will sting anyone who invades their space. Having said that, we consider the bald faced hornet the “B-52 bombers” of the wasp family — they are less aggressive and they fly slower compared to the yellow jacket wasp. Don’t take their threat lightly! Bald-faced hornets have smooth stingers, so they can sting multiple times. Their stings also carry venom that makes it painful, itchy and swollen for about 24 hours. The danger is particularly grave for anyone who is at risk of an allergic reaction to the stings. If you are not allergic and you don’t mind the risk associated with taking the matter into your own hands, you can kill the colony by spraying a wasp and hornet spray into the nest opening during the nighttime. However, you should examine the nest in the daylight to determine the safest approach (note: you should never simply spray the exterior of the hive, as this will only serve to anger the insects. The spray must be applied directly into the opening). We do not recommend taking this risk. For most people, the best and safest approach is to consult with a licensed pest management professional to take care of the hive. If you have an issue with bald faced hornets and want additional information, please contact our office for prevention and treatment options.